This looped and knotted section of cords is not only beautiful, it's also a 500-year old mathematical tool. "I'd love to know what the deal was with the Incan knot counting system," commenter Sajanas1 recently wrote us. "It was probably just some complex abacus like system, but it seems pretty unique." The knot counting system is actually called a quipu, and it served a rather different function than an abacus. As the University of St. Andrews' Math and Stats department explains, it "was not a calculator, rather it was a storage device." It wasn't just the device's function that made it unusual, though, but also the fact that it was actually developed before a writing system. As such, it became not only a counting tool, but also its own system for records-keeping. Numbers were recorded on strings of a particular colour to identify what that number was recording. For example numbers of cattle might be recorded on green strings while numbers of sheep might be recorded on white strings. The colours each had several meanings, some of which were abstract ideas, some concrete as in the cattle and sheep example. White strings had the abstract meaning of "peace" while red strings had the abstract meaning of "war". 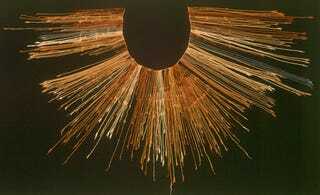 The quipu was, it's true, not particularly simple to use — which is one reason that is was primarily left to the experts: early, court-appointed mathematicians called quipucamayocs, who were responsible for both getting, and then holding on to, these ancient records.